Bol-anon: Chocolate Hills in the new 7 wonders of nature? 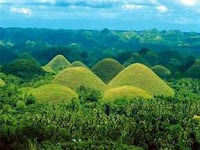 Chocolate Hills in the new 7 wonders of nature? Last July 17, 2007, the New 7 Wonders of the World were announced during the Official Declaration in Lisbon, Portugal. The list included the Chichen Itza of Mexico, the Christ Redeemer of Brazil, the Colosseum of Italy, the Taj Mahal of India, the Great Wall of China, the Petra of Jordan, and the Machu Picchu of Peru. Now, after the resounding success of the search for the new 7 wonders of the world, the organizers, the New7Wonders Foundation, is now conducting a second campaign, this time for the new 7 wonders of nature. Qualified to be nominated are all natural sites, natural monuments and landscape. The Chocolate Hills is now ranked no. 9. The other nominee from the Philippines, the Tubbataha Reef, in now ranked no. 8. Voting is going to last only until December 31, 2008. After that, a declaration will be made and the winning sites/countries will have plenty of bragging rights. Wouldn't you want the Chocolate Hills to make it to top 7? If yes, then we need to vote and we need to actively campaign and tell the world of its beauty. To vote, please go to the 7 new wonders' page on Chocolate Hills and find the link below. We can do it! I wonder if there are like minded individuals out there who would be willing to work together to campaign for chocolate hills in this search for the new 7 wonders of nature? Me, me, okay,,,I will vote for it. Hello Gibo! I just found your blog. Nindot jamo imong pictures. Great job! How are you? hi gay. thanks for visiting my blog. long time no hear. regards. 1. Build one Nipa Hut (ex. Bohol Tropics' cottage) enough for one family tourist, with kitchen and T&B in each plateau hill. 2. Road nets linking the hills. 3. Construct a "Golf Green" only, no fairways. 1. One hut only per plateau: extra huts will destroy the normalcy of the hill. 2. Pure government funds needed. 3. No roads going up the plateau, roadnets shall only be available at the base of the hill. 4. Minimal staiway pathwalk going up. 5. No excavation allowed that changes the original shape of the hill. 5. No riprap & fences allowed. 6. For the "Green", no further construction of fairways of golf course, preservation the local agriculture is a must. 7. Improve local farming that will become a fantastic scene for tourist, like the use of carabaos. Use of mechanical farming is controlled- "the use of carabao is the key issue in tourism." End state: Help the people of Bohol by maximizing tourism on Cholate hills for scenery and improving the agriculture (rice & vegetable production & others) that will become a showcase. By doing so, it worth more than becoming one of the Wonders of the World. My dream: "Exercise and play golf on top of the hill -never mind the fairways- while on vacation staying on a modern Nipa Hut, see the hill and the ricefields with carabao farmers around, and breath the breeze of nature. Have you imagine the wonder?